I'm not sure if you remember this, but a few months back we asked you guys, "Hey, what are you doing in my kitchen at 3 am eating my Oreos?!!?" Oh wait, that was someone else. We asked you, our illustrious JayIsGames community, tell us what you want, what you really really want... in an escape game that is. And, oh boy, did you answer, all giddy and eager to be locked up again. Not that there was a unified consensus on what should be what, but some repeated refrains did stand out of the chorus. When Littleghost said, "Funny and weird are good," while JustMe added, "a little creepy, a lot interesting," a whole bunch of you (Gen, NohWoman, simplynigel, Friar, Shudog, and many others) echoed resoundingly: "Mateusz Skutnik!" You were heard. Escape from Jay Is Games is the result—fan fiction, made by the creator with the players in mind, containing all that wonderful Mateusz vibe, with embellishments from his popular series topping a slice of JayIsGames, and rendered into a single room escape. Besides being treated to Mateusz Skutnik's remarkable artwork, his user-friendly and well-tuned interface enhances the thoroughly immersive escaping experience. Click to interact with the environment, navigating the room by clicking the edges of the screen to change angles, dragging objects from the inventory to use on stage or clicking items to view in closer detail. The changing cursor highlights interactive zones to meet the no "wristing-breaking, mouse-mat-burning" pixel hunts criteria requested by rookwings along with the rest of the JIG community. That said, Mateusz's high quality design makes distinguishing objects worthy of note quite apparent and every detail is so palpable, you'll want to click everywhere anyhow. Likewise, many of you requested, as did awp81, "logical puzzles that are accessible to all." Having a game than anyone can play and enjoy is indeed important, and Escape from Jay Is Games is an escape-the-room game in the truest sense, more on scale with Where Is 2014 in terms of difficulty and length. Conversely, if you hold high expectations of epic adventures with labyrinths of rooms, layers of secrets, and cranial-scratching riddles, you face a harder fall into disappointment. Your wish lists are not completely crossed off, yet fortunately that leaves rooms more for future creations and diverts loftier anticipation back toward the next Submachine and Daymare Town installments. While there's plenty for fans of those series to recognize, lots of souvenirs of mysteries and mythologies from episodes past, and maybe even winks toward future doings, this is a more humble endeavor in comparison. Although too much narrative would've made EFJIG less inclusive, narrowing the possibility of player interpretation, you might also sigh the lack of story beyond a scattered subtext. It's best to go into it, despite all the ideas you've had simmering since the notion was first posed to you, clear of expectation. Then you can take in the unsettling-yet-beautifully surreal scene, heaped with atmosphere and red herrings, without urgency or strain. The art is as striking as ever, giving fans more of what we crave, and it's remarkable how well some line drawings and color, given a bit of sound and interactivity, can evoke so much mood and enjoyment. Keep the volume on, take your time to explore, smile at allusions, soak in the environment—which Skutnik's creative imagination leaves us so apt to do—and enjoy what is here. It is truly enjoyable while it lasts. Escape comes quicker than you'd hoped, as both the game's length and the compelling immersion will likely leave you wanting more and reluctant to leave when the opportunity is given. Come to think of it, I'd better go now, and leave the heftier analysis to you. You know, before I end up like that guy on the bed. Escape from Jay Is Games Walkthrough now available! To complete the game, you have to collect four reptilian limps and a valve, and then use them all over the main entrance in the room. Starting scene: The scene you start in. Bed scene: The scene with the stone statue in the bed. Main entrance scene: The scene with a door full of golden sand. Junkyard scene: The scene with old and broken machines. Open the lowermost drawer in the bed scene. (Lower left) Get the knife and turn right twice to the junkyard scene. Use the knife in the leftmost coin slot, and get the coin. Turn back to the bed scene, and put the coin in the piggy bank. (Middle left) Get the reptilian limb. Grab the floor brush in the lower left of the main entrance scene. Pick up the transistor in the junkyard scene (on the floor between the two middle machines), and put it on top of the machine in the starting scene. Pull the lever, and wait for the "welcome" sound. Click on the screen and on both green switches to open up two buttons in the starting scene. (upper left) Push the right one of them. Turn right to the bed scene, and enter the hole in the wall. Use the floor brush on the reptilian limb in the lower right, and click on it to pick it up. Push the red book lying on the other books on the bokkshelf in the starting scene. (Upper right) Get the note that falls out. Zoom in on the chalk board on the left part of the starting scene, and use the note to get a 5-number code. The code changes every time you play. For example, 5 means the fifth number counted from upper left, and red left to right, top to bottom. In the bed scene, push all red pillows once to reveal a key. Use it on the chest in the upper right of the main entrance scene to get a mahogny eye. Turn left to the junkyard scene, and get the mahogny eye from the hole in the wall. Turn left to the main entrance scene. Put both eyes in the strange statue in the upper left. Get the reptilian limb. In the bed scene, click the valve in the middle right part of the screen 4 times. Turn right, and get the valve from the floor. Put all 4 limbs by the statue over the door in the main entrance scene. Put the valve in the hole over the door, and click on it to turn it. Click on the hole in the ground to enter it. Continue going down, and drop down through the hole in the end. This is optional steps that doesn't affect gameplay. - zoom in on the chalkboard, and get the leftmost crayon. Use it on the spot in the middle right of the chalkboard. - get and read the notes on the bed, and the one under it. - open the top drawer and get the pristine nail. Use it on the wall behind the alien. - push the game controller in the lower left. - use the knife on the piggy bank. - push the button in the middle right. - put the knife in any coin slot after getting the coin. Does anybody understand the 'All play and no work makes Jay a dull boy,' code? A small key, knife, nail, valve and 2 reptilian hands. I placed a mahogany eye and am looking for the other one. Any ideas? A walkthrough will be available soon but for the moment we prefer to let you searching and discussing. Why don't you try and get a coin back from one of the arcade machines. The key does open up something, just gotta find the chest! I have 6 notes, knife, valve, and 3 lizard limbs. You can use the nail on the wall behind the bed. don't know what this achieves though. Thanks Jeff, looking forward to exploring! Maria, found the chest, no idea what to do with the contents yet! If I had a code to enter, where would I enter it? I'm stuck at the same place you are. I've already placed the three limbs in their proper area. The only thing I'm getting at is the six notes go hand in hand with the chalkboard and the arcade machine override. Any ideas? Nice little game; good job Mateusz. where do you place the limbs? there is also the numbers "731" at the bottom of one of the arcade machines. I am still stuck. Any one know where to use the broom? Have you opened up the hatchet to the outside yet...? I'm stuck in the video game code. And I've no idea what "731" could be use for. -Already for the 3 limbs. figured out where to place limbs, the websites nav bar was in the way haha. But still not sure about code, I know where to put in a code, I just don't know what the code is. One thing I noticed about the code sheet and the chalkboard, the one of the numbers is 93, but there is no 9 located on the chalkboard. Still lost at what the 731 can possibly mean. I have placed three limbs. I still have the valve and the knife. Can't figure out the code either. Been looking the note and the chalboard. The board doesn't have any nines? Haha gotta look over every possibility with these things! I have tried using "731" and #'s from the code sheet, but no luck on the code, perhaps the symbol on the chalk board is in place of a # we need to figure out??? The chalkboard is 10x10, so that's 100 spots all in all. I'm guessing the code numbers go hand in hand with each page, and each spot. If my guess is correct, is spot 76 = weird symbol, or is it like a x by y graph (93 = 9 right, 3up)? I'm trying to cross out the 7's, 3's, and 1's on the board, see if that gets us anywhere. The symbol is something we definitely need to figure out. If it's a X/Y code, shouldn't have negatives? 1) Have you found a way to get outside the hatch? -- 2) I'm assuming you have found the key, have you found the chest that it unlocks? Yes most of us have solved this, all we need is a code, and a another use for knife and a use for valve. Chalkboard code made no sense to me at first. Even after I knew how it worked, I know there's no way I would have figured that out on my own. Sorry, was helping out someone else on their journey. ^^; I'm gonna play around with the knife and the valve, see if I can find anything for those. SERIOUSLY? D: Throw us a bone! I would look up a walkthrough... but I don't wanna spoil it completely for myself. 5 numbers are needed for one of the screens. If you haven't made it that far, don't read on. The clue that we have is coordinates. First number is missing 0 to make it 05. Should even be able to get it with trial and error a couple times. This room has now been added to the Submachine Universe at coordinates 731, so I'm presuming it's just an inter-game easter egg? I KNEW IT! IT IS A CARTESIAN COORDINATE SYSTEM. Just double checking, does that mean the lower left hand corner the starting point? Escaped! Nice game, Jeff, thanks! Figured out way to solve for code! Use the code paper, and use those numbers to find the position on the chalk board. And I am out, was a great game! Good luck to everyone. My second guess was wrong, it isn't a coordinate system. My first guess, on the other hand, was correct. It's a 10x10 grid, which means there is 100 numbers to get our code from. Which numbers are on the code list again? Start from the upper left hand corner (1-100). the grid of numbers. Do I count over, then down? I understand that it's a 10 by 10 grid, and it involves counting the numbers as coordinates, and that you start at the top left, but I don't understand if I should count down-then-over, or over-then-down. I wish I could attach a screenshot! I had the first 4 digits right, and then I think somehow I brute forced the last one? So weird. I thought it was 2 digits greater. What a treat. Thanks so much for this game Matheusz. I did need the hint on the chalkboard, thanks for that. They are all The Shining references (movie). It's a horror movie by Stephen King and in one scene it is revealed that Jack Torrence's 'big project' was just pages and pages of 'All play and no work make Jack a dull boy'. Not really sure how the reference relates to the game. It should be 'All work and no play'. It's the reverse in the game. Am I missing anything because my cursor doesn't ever change? As all of you I am stuck with the primary override code :/ I tried to find an easy solution, but with no luck so far. I have pristine nail, knife and valve and 3/4 limbs in place. Has anyone figured out what the code numbers are for? Or more precisely how to use them? Shipoopie, most of the hotspots are very small. I had the same thought when I began the game. Your cursor changes when you change the view, right? the grid numbers don't work the same for the vertical and the horizontal axis. hope that clarifies things for people! Here's how to use the code numbers to get the primary override code. Take a look at the chalk grid of numbers. Counting from top-left, reading left to right and up to down, count out your first code number. This is the first digit of the primary ovveride code. Count again with your other code numbers to get the rest of the digits. That's really weird. I just checked with both browser and download version, and my cursor changed in both of them. Where is the download version? Just under the big 'Play' button at the end of the review. You can choose Mac or Pc. Glad you guys liked the game. It kind of holds a bigger easter egg. Did anyone find it yet? Are the ). ( symbols red herrings, or do they have to do with the easter egg? People sure did have a lot of back and forth about how the chalk board worked. Saying the 5 has an implicit leading zero just convolutes things. Counting 1 to 100 is the better way to think about it because otherwise you have a coordinate system where the origin has a different value depending on the dimension. Zero for vertical and one for horizontal. SNEE is mentioned in the walkthrough. I went and checked the Universe game and there it is! Parts of this game are there. Even the weird red herring symbol. But maybe Mateusz just didn't find it? The screen with all of the broken electronics and the broken submachine video game and screens and stuff, you can click on one of the screens and it asks for a code. Shoot! I forgot spoiler tags!!! Limb 3. I'm supposed to get a piece of paper from the book, which i do have. then it says to look at the chalkboard on the left and figure out the code. I did that. problem is, i don;t know where to type in the code. Can someone help? A description how & where to use the 5 digit code from the chalkboard might be lovely? you haven't fiddled with the arcade games enough. ...I wonder: why am I exiting with a knife in my pocket? Again, I think I'm best waiting on smarter folks to figure out whether or not it has to do with anything, or other missed easter eggs. Because, well, I really don't want to look like that other unfortunate JIG reviewer. The price of a good moisturizer these days! the SNEE addition (I was really hoping the riveting game of pong was there) isn't it... then what is? I have an hour and a half until I have to go to work! LET'S GO EXPLORING! for those that are stuck with limb 3, that's because the walkthrough is incomplete. ). ( is in the #49 spot on the chalkboard. But now elle makes me think I should keep looking. I can't afford moisturizer! I'm trying the weird symbol as the starting point for counting on the chalk board for a different code but so far no luck. All play and no work makes Jay a dull boy. knife in your pocket might be like a hint that the next game will start off with you having a knife. By "It kind of holds a bigger easter egg. ", Do you mean like how the structure we have to escape from kind of has an egg shape? That's a pretty big easter egg. But is it THE easter egg you were talking about? Looking forward to this all day - but I cannot seem to get the HD version for Mac to run.... it keeps telling me that the app is damaged and I should send it to the trash. Is there a trick to running the app that I'm missing? Did you try deleting that one and re-downloading it? I re-downloaded a couple of times, and tried opening the zip file from the command line rather than double-clicking (in case there was an issue with the zip file). Time to reboot and then try another download. All I did was double click the .app file. I'm having the same problem, too, with the mac file. Has anyone gotten the mac file to work? I'll ask about the Mac fil for you guys. Whoa I got a mention! I feel so complete. connects the symbol with the Pong game. I thought about the notes but they didn't seem to form anything, other than matching with the chalk (it's 10 words per line). Unfortunately waiting for the score that corresponded with the symbol didn't do anything. There's also the disconnected switch attached to the orange stuff. Yes, you are totally right about that, i'm sorry that i missed that. Does the valve has a use in the place it sits in in the beginning? How are you able to use the knife multiple places simultaneously? At least for me, you click on a spot, and when the knife is in it, you click another. The problem is that you can't see you rmouse cursor when the knife is in a slot. On mine I could see the cursor and I got all of the slots going at once and nothing happened. It's probably a bug. I never thought that playing in Murtaugh's game would lead me here. I never thought I would have to make a choice. I was just following his orders. Right now it's too late for me to change sides. For you as well, probably. It's a reference to a horror movie made by Stephen king, it's nothing that's Too important, just focus on finding the things.. Sorry for that, I confirm the mac version does not work. I got the same message about the 'app corrupted'. I've alerted Mateusz so I hope to have a good version soon.
" Einstein is gone. Again. Note to myself - stop worrying about that damn cat. " Am I the only one in thinking the chalkboard is too obscure? I've tried half a dozen different ways and keep getting myself confused and/or not finding the right code. I love Mateusz's work, and this is no exception... but I sometimes feel like his puzzles are getting not more difficult, but more opaque. Maybe it's just me considering the number of people here who figured out the code. In the meantime: please sir, can I have some more? ...counting the numbers on the chalkboard. And, sure enough it was. Leave it to Mateusz to turn something so straight forward into something so mysterious! I thought it was very clever to disguise it in plain sight, so to speak. Long time player, first time contributor, love Submachine and the interconnecting puzzles. You're braver than I if you search for the key. The "pyramid key" is in 378! The switch can be used in 731, and it opens a karma portal to a room with drawings in it. The M E A L symbol reads Aiden Wylie when moused over on the drawings. Is this the end of the easter egg? Maybe you can put something there? It can be used in 731, on step to the right of the first karma portal. Use the shutter switch mentioned in my previous comment back at 731 in Submachine Universe. Opens another portal. The switch goes to a place with weird microscopes. I wonder if the dull boy papers are somewhere in the universe game and need to be looked at with the microscopes. But since it's not a game, there's no way to know where it ends. In the purple pyramid with the box that you use the key for to get the switch, to the right is an upward going shaft and a plate inside says "found by senior scribe paula saavedra"
Note from Mateusz for Mac users: you need to change user's security settings in order to have the game working. No way I'm blind-jumping through all 999 possible locations in the Submachine Universe. I started, 'cause it's my day off and I have nothing better to do, and I got until the 230's until I ran out of steam. Yup, there's definitely somebody out there more obsessed than I am that is better equipped to comb through all that. I'll note, too, that once I ran the app, I was able to reset my security settings to where they had been and the game opened fine. Great game! I did need to get help on the code, but otherwise didn't need to use the walkthrough at all. In the Submachine Universe, I already used my valve that I found from (a portal from) 001 at 006. Is there a second valve somewhere? Sutnik said he added content that confirms something about the nature of the subnet. It kind of does. You guys must be dancing an efjig. Almost 12000 views on this game. Is that a record? Tracking page views (as a number on the game's review) is only a couple months old, but I think (one of) the records EFJIG needs to beat might be held by this Virtual Villagers game. But it's great seeing how many people are enjoying this escape game! 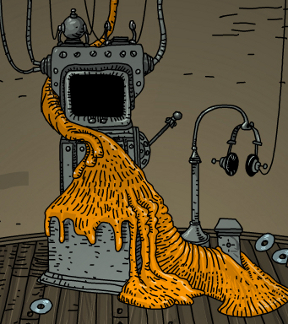 The EFJIG room in the Submachine Universe! Looks like JiG beat DROD. TSS is at 99.65% right now. I suppose no one's going to point out the obvious... that this game does less to advertise Jay is Games than funnel players into the existing Submachine universe. And played all submachine games. You can use all the codes you ever found. All. of. them. I found it in the subnet. i have gone past all 999 places. And i found it there staring in my face )-( at 232 )-( = 731. That one was very sneaky! It's fun to pretend that all of these things were there all along and we just didn't see them until now. The SNEE location is a direct reference to this game. The locked chest is there, the arcade games, the items, the background objects, the ")-(", its all there. The code to the solve your code is there, you just have to find the objects that can let you unlock the chest, the safe, and the security network hatch. But those items are in the net and the only way to find them is to explore it. My code doesn't work with the code screenshot. I'm forever stuck in this game. treating the chalkboard grid as 0 to 100? 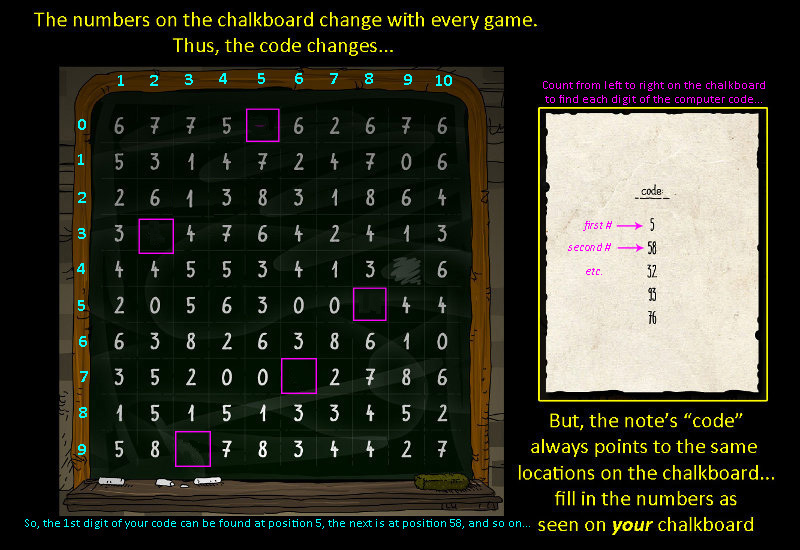 ...you can count the numbers on the chalkboard in your game as if on a grid. There's 100 places on that chalkboard. So, to find the first digit in the five digit code, start in the top left corner and count however many places across (it is 5 for me) and read that number. (For example, for me it was an 8.) Then, do the same for the next digit (I had to count down to 58, so I went to line #5 on the screenshot as the top line is 0, then counted over 8) and copy that number (for me it was 3. Now the first two numbers in my code are 83...). The numbers on the piece of paper are the same in all games. It's the numbers on the chalkboard which change. Elizabeth Einstein an alter-ego for our friend Mateusz? I am honored to have been mentioned in the review as one of the great fans who hoped for Pan Skutnik to gift us yet another game. Fantastic! Thank you, JIG. Thank you, Mr. Skutnik. I'm probably going to get a lot of hate for this, but I actually think that Mr. Skutnik was not the best person to do the JiG escape. I've spoilered my rant for its length, and also because some people seem to take personal offense against comments of this type. It's not that I dislike his work; to the contrary, his submachine games are the best of their type that I've ever played on the web. But I believe that his style is not well suited for single-room escapes, as his puzzles are mostly environmental or inventory puzzles, which involve manipulating the environment to cause a new area to open up or what item to use where. The biggest 'puzzles' in his games are basically finding a code, and finding where to use it. This crucial design difference between Skutnik's style and that of escape games is clear in Escape from JiG. The only real puzzle, the chalkboard puzzle, has already been described as too obtuse and ambiguous by many commenters. The rest of the game basically amounted to a search for items and their places of use. And this works okay for the Sub games, with their amazing environments and interesting machinery/mechanisms, but for a single room escape? Tedious. A great escape has original, or well implemented puzzles that make you suddenly think 'Aha! ', as all the pieces fall into place. And I'm sure many people will agree that the chalkboard puzzle was neither original or well implemented. The best escapes I've played have moments that I will never forget; the clockwise maze in Loom Dawn, the final puzzle of Small Room, the symbol/number puzzle in Vision, or the final puzzle in Escape from the Concrete Tower. But really, there is no great moment in this game. There just isn't enough substance here: pretty artwork, haunting music, item hunts, and one obtuse puzzle. I do not mean to cause any offense to anyone, especially not Mr. Skutnik himself (his Sub games are truly brilliant), but single room escapes... just aren't quite his style. Why hate? You have the right to have your own opinion and express it. It probably came out wrong, but what I was trying to get across was that on many forum/comment sites, a negative view for something that most people liked is often attacked, or labelled as a troll comment. I haven't seen many cases on JiG, but there have been a few. Like I said, probably came out wrong. Sorry! It's not a troll comment if you state your opinion respectfully and explain why you feel the way you do. I enjoyed this little game even though I agree that the chalkboard puzzle wasn't all that great. And also thanks to Mateusz for this game! What's this "submachine universe" everyone is talking about? I've played all the submachine games but not sure what you are referring to here? Submachine Network Exploration Experience is where you can poke around through the Submachine universe. The next time I lose a needle in my haystack, I'll know who will be able to find it for me......Elizabeth Einstein! Reka: I won't give away the true identity of "Elizabeth Einstein", but I can assure you that it's not Mateusz. Scroll back to page 1 of the comments. Mateusz's "alter ego", as you put it, was "daymaretown", but I think he only used it the evening of the game's release. He is a very busy man! I know the code, but no place to enter it in. Nothing on the chalkboard will bring up the cursor??? Go to the old arcade machines and click on their screens. One of them will have a code input. Took me around 40 mins to solve it. Is that the time intended to take? In the starting scene, there is a computer with a "secondary defense system", and the left-right configuration of the dots controls whether or not the hanging buttons in that room are covered or uncovered. If uncovered, each button can be changed to up or down. Up on the left button corresponds to an open hatch in the arcade scene, and up on the right button corresponds to an open hatch in the junkyard / arcade scene. But the junkyard scene hatch is covered over in wood, so we can't get through it. Knife is the only tool I have left and I can't find anywhere to use it. Anyone know how to get through this hole? the weird symbol and how it points you to the Submachine Universe exploration thingy. But, if you can figure out a way through the wood, then let us know! yea!! i made it out... very clever game. I'm just wondering where in the game is information about how to use the board - why the numbering started vertically from 0 and horizontally from 1 and why first is vertical line and the first number on the paper is 5, there is no 0, it's confusing. @Filip, there's no need to complicate it that much, and thus no need for any extra in-game explanation. Just count from the top left, same as if you were reading. All that column and row numbering and starting with 0 vs. starting with 1 is just people trying to explain how to find the numbers without actually counting to 93. The proverb "All work and no play makes Jack a dull boy" is many centuries older than Mudvayne or Nu-Metal (or old-Metal, for that matter). I was so confused about the 5 digit code. It took me SEVERAL tries to realize that the x&y were opposite and that the y did not start with 0 like the x did.